Martin slices through the cones on his way to first place in CSP class with the Miata! This weekend saw the Miata again pulling double driver duty at Darlington Raceway with SCR-SCCA for the fourth round of the 2015 points championship. It was a warm day, but the car held up solidly for both drivers and came home in first place for the ES class under the steady hands of NMS South! At this time Brian is sitting in first place for the season. After discussing strategy, fun runs at the end of the day revealed even quicker times that were a lot of fun but didn't get any bonus points. More learning, more practice! 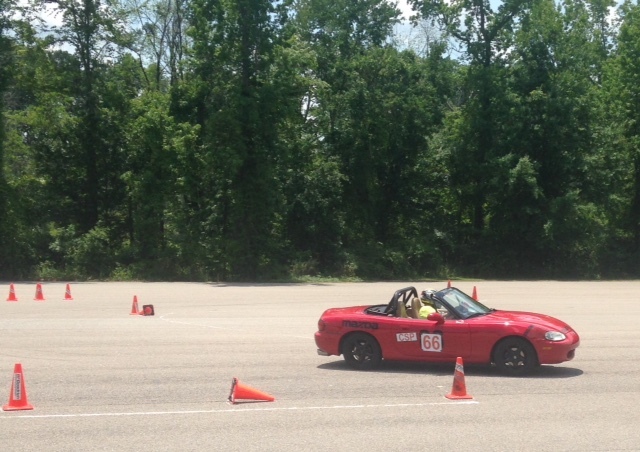 Later this month, the full NMS team will be together again to take on the Tidewater Sports Car Club in Virginia Beach for a Fathers' Day autocross! It'll be a tough battle between the Abarth and Miata with Robert attending the Evo Performance Driving School on the Saturday before the event! The following Sunday sees SCR back down Florence to conclude the first half of the season. The weather is heating up and so is the racing action! Doctor Confirms: Car Magazine Addiction! EVO Driving School: FIAT Student's Report! Crafty Camera Clicks: Cars and Coffee! Sports Car Club of America (SCCA) New Web Page! New Season: Comedians in Cars Getting Coffee!